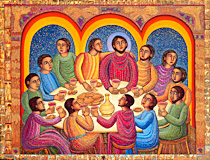 Eyekons Gallery | John Swanson homepage - featuring the art of John August Swanson: original serigraphs, posters, books and cards for sale - stock images for publishers, graphic designers and advertising - church stock images for bulletin covers, PowerPoint, and websites. John August Swanson makes his home in Los Angeles, California. He paints in oil, watercolor, acrylic and mixed media, and is a master printmaker of limited edition serigraphs, lithographs and etchings. John's art reflects his wonderful gift of storytelling and his unique ability to "bring stories to life." His inherently narrative work explores human values, cultural roots and his ongoing quest for self-discovery through visual images. 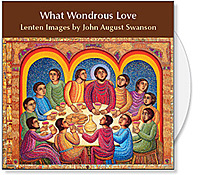 CD Collections of the art of John Swanson offer churches an affordable source for religious art & Christian images. A great visual resource for sermon illustrations, bulletin covers and church powerpoint presentations! 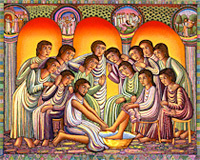 Eyekons Church Image Bank features John Swanson's art as stock images for churches and in an inspired collection of thematic CDs. 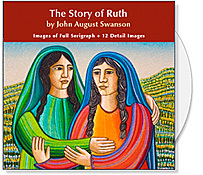 View a beautiful portfolio John Swanson's serigraphs available for sale. His narrative art brings stories to life that you can live with and learn from. See for yourself! 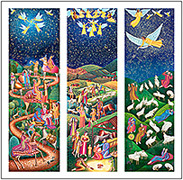 John Swanson Posters of several of his unique paintings, most popular serigraphs and Advent Triptych. A great way to share the gift of art for Christmas! John Swanson's art has been an inspiration to many writers. 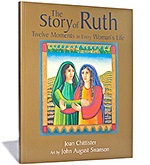 See books on St. Francis, The Story of Ruth, The Prodigal Son and his Millennium Day Planner. 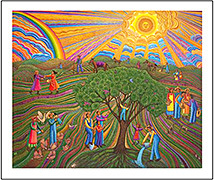 Eyekons Stock Image Bank offers John Swanson's art as stock images for publishers, graphic designers & advertising agencies.